It's sometime after midnight. It's been a long day with various and sundry things that've kept Darsce, in her capacity as headwoman, on her feet more than she ought to have been. She's remained later than is her norm over in the caverns as first minor mishaps, then meetings followed by scrambling through her files kept her. Checklists of recent visitors and new residents alike with notes including their point of origin needed to be found and delivered to the proper people. Consequently, she's finally dragged herself home, probably close to bedtime, bathed and fallen into bed with or without Jethaniel but somehow managed to tangle sleepily - and awkwardly thanks to her belly - with him when he joined her there. Sleeping deeply is what she should still be doing, but she's restless, shifting now and then in a vain attempt to seek comfort. In the faint blue light of those stars her forehead twitches intermittently with vague discomfort. The tiny gold firelizard that Darsce still hasn't named is there also. The naughty thing has snuck from the pillow on the floor she's been allotted for her own bed, and curled around the top of her person's head. She's found herself at risk of being flattened, so now sits on the pillow watching with yellow eyes. Finally she can take it no longer and trills a silvery note of concern. Jethaniel was kept at work similarly late to Darsce - for not entirely dissimilar reasons - and yet his exhaustion was significantly less due to certain differences in their current circumstances. Nevertheless, he accompanied her to bed with moderate promptness, and is at present carefully tangled together, asleep. Darsce's faint stirring has, thus far, been insufficient to wake him; his lying awake for the night has - or so he believes - already been conducted. It is at this juncture that the firelizard trills her concern, and Jethaniel's eyes open. The alarm, such as it is, is sufficient to wake him; it is not the usual means by which he is brought to wakefulness, but he does tend toward lightness in his sleep, and as such, it suffices. "…mmh?" he asks, of nothing in particular. He regards the ceiling, which is at present the primary source of light, then lifts his gaze to Darsce… and, in proximity thereto, her firelizard. "…you are not permitted there," he notes to the gold, albeit in a mild tone and without any particular expectation of compliance. He is, in fact, more concerned with Darsce herself than her reaction to the unnamed gold's behavior, and as such his eyes return to her once more, his upper arm untangling sufficiently that he may brush his fingers gently along that brow as he observes his wife. Were Darsce sleeping deeply- ah, but she's not. And so, though she hears the firelizard, that's not what wakes her. Though at the sound a flicker of annoyance does cross the brow Jethaniel's fingers trace, it's more the absent irritant caused by a mosquito-like buzz. His touch soothes that, but his voice rouses her. "Unh. I…I'm not?" She cracks her eyes, for even the starlight seems too bright and it's just in time to see the baby gold sidle close enough to rub her head against Jethaniel's fingers with a beseeching chirrup for the mild reprimand. Oh. Her. Darsce's mouth forms a line of displeasure. She echoes her husband, only uses less words and more harsh, "Get!" The tiny firelizard sighs and reluctantly retreats backwards, bestowing affection in her wake with little flicks of her tongue repeatedly, to kiss whatever she can reach, be that Jethaniel's fingers, Darsce's brow, ear or her hair until she's at the edge of the bed and then with a little hop tumbles dramatically nestea-plunge style onto her floor pillow. Banned! So tragic! Darsce…isn't watching her. She's rolled onto her side towards her husband, curled into herself but without comment, eyes drifted shut as though sleep is all she seeks. Beneath Jethaniel's fingers tiny dew beads her skin while her breath pauses for several seconds then resumes. Darsce is not only permitted but encouraged to be here. The firelizard, on the other hand… is not. Jethaniel does not actually expel her, nor withdraw his hand (be it the one, or the other) from her nuzzling, but neither does he present any arguments on her behalf. She will doubtless learn (presuming she has not already done so; creatures are often efficient in that regard) that when he is the one present, she may get away with far more than Darsce will permit. This would still be true absent her mournful shows at being prohibited such opportunities; in fact, as she retreats, Jethaniel is not particularly watching. His attention has returned to Darsce, and the moisture he feels which is not - in this case - due to that golden lizard's bountiful affection… or at least, not wholly so; it is concievable she contributed over the course of her withdrawal or through attempts to soothe the sleeping Darsce prior to the concern which awoke her husband. In the firelizard's forced absence, it is Jethaniel who expresses that concern, studying Darsce's expression with a frown that appears as her breath pauses. His hand turns, curling fingers against her cheek gently as her breath resumes once more and he asks, "What is it?" Darsce might be a wee bit territorial about that bed. Other females not allowed! Stardust would be equally unwelcome, though Darsce might express her preference to Jethaniel rather than the green, which she usually ignore-tolerates unless she's being flutter-angsted at and Jethaniel isn't present. "It's noth-" and again she stops breathing momentarily while behind her an ochre-streaked head pops up over the edge of the bed along with two rust-speckled paws as the little hatchling creels worry. She's not on the bed, but as long as her hind paws remain on the floor cushion, she can peek at the bed, yes? Darsce's tightened curl eases; she breathes once more. She scoots closer to Jethaniel and seeks to curl closer into him, find a spot in the hollow of his shoulder where she can burrow her face. "…nothing," she finishes as if she hadn't been interrupted. "Something I ate…" Only she doesn't sound too sure when she says it and the, "I'm sorry I woke you," though so totally backwards from who woke who, is genuine enough to be strange. She's weaseling in, arms wrapping around his form, leg hooking over his and her body utterly relaaaaxing to find sleep again. Aaaand this works for all of about eight minutes until she tenses slowly and stops breathing again. Stardust is more likely to be found down in the basement, sleeping - depending on the season - either along the spine of that couch set beside the central heating column or curled in Jethaniel's work-chair. If, that is, she's even asleep; the green firelizard's life tends to be her own, intersecting primarily with Jethaniel's and then at the times and places of her choosing. She does not seek to compete with Darsce; the instincts of a green know how to respond to a queen… or two. The younger gold has been received with a tolerance that drifts toward dutiful assistance or long-suffering protest depending on the occasion, but on this one - as with many - Stardust is absent. The young gold would evidently like to be even more present than is permitted, given her attempted use of technicalities, but the circumstances which have her so concerned are also distracting the humans from noticing. Jethaniel's frown deepens, his fingers trailing down along Darsce's shoulder as he observes her tensing, his own breath coming a little quicker in response to the brief absence of hers. Her explanation is unconvincing to him; his frown lingers, though he nods. "I am not," he replies quietly, kissing at her hair as she nestles in against him. She seeks sleep; he… does not, eyes remaining open as his hand moves, tracing along her back with a slow, soothing motion. At some point, he would likely also return to somnolence, but the necessary duration to produce that effect - as it is greater than eight minutes - remains hypothetical. His hand pauses as well, the tension in it from his concern significantly less than that which Darsce is exhibiting. If the little gold finds it odd that Stardust doesn't cling to her person, her behavior isn't reflective of that. Thus far she's taken things in stride, having flittered and gamboled about the dwelling exploring and poking at things. Things don't interest her so much; living creatures are better! So in the process of familiarizing herself with her home, she's likely found the green in some of those spots, greeted her with happy enthusiasm and attempted to entice her to play. Most of the time she haunts Darsce, who has learned to endure it with barely contained exasperation. The attempt to sleep is fail and Darsce gives it up with a restless heave of her body to flounder up from the bed. With a mumble of, "Be right back," she wobbles off to the bathroom, followed by the tiny firelizard who flutters anxiously in her wake to hang on the doorknob. The sound of tap water running longer than might ordinarily be needed for washing her hands can be faintly heard above quiet peeps of encouragement, but it's some time before Darsce emerges mopping her face dry. Upon returning, she flops awkwardly back in bed towel still in hand; the gold flutters to the headboard. "I think I'm- it's-" she begins only to tense again and curl towards Jethaniel once more. This time, despite her best effort, she groans. It takes her a few breaths before she finishes, "-time." There do exist occasions on which Stardust is inclined to play. There are even times when she will demonstrate affection to the gold; a lick or nuzzle, or permitting the younger firelizard to cuddle against her. She is not averse to the creature (or living creatures in general), she merely… tends to have her social requirements already fulfilled. It is thus - from the green's perspective - fortunate that the gold is most inclined to spend time with Darsce. Darsce's perspective may (does) differ. Jethaniel shifts as Darsce does, his hand trailing down along her back as he half-rises. He nods to her assertion, and while the young firelizard follows, he does not… merely sits there, observing the doorway as if it will provide some form of answer. It does not, except insofar as it - after a somewhat prolonged but not overly excessive interval - provides Darsce once again. Jethaniel smiles for her return, but it's uncertain; there's concern lingering in his expression. His shift toward her is prompt, arm reaching to encircle her once more. She is - it is - his brows begin to rise, and then the answer she intends to provide is delayed… or at least, the verbal form of it is. Her body is certainly providing an answer, as she curls to him and Jethaniel curls his arms around her in answer. It is providing the same demonstration as before, the one from which she derived the postulation which she now wishes to convey. "…ah." The time is sometime between evening and morning, but it seems unlikely that the temporal juncture in relation to Rukbat and Pern's rotational periods is what Darsce wishes to convey. The time - in relation to Darsce… is… "Now." Jethaniel is not, himself, entirely certain what he wishes to convey by that word. It may be a reference to that rotationally-based time and a consideration of the suitability thereof; it may be an attempt to assess the required actions of the moment. His fingertips slowly drift across her back, then pause. "We should…" Prepare? Ideally, this would already have been conducted, given that Darsce is, at present, ill-suited to engage in anything beyond the biological processes already begun. As such, Jethaniel asks, "What do you need?" The tiny gold might as well be invisible for all the attention Darsce pays to her currently. The creature is not only confused and worried but each time her person tenses and stops breathing she flutters her wings, eyes flickering yellow flecked with red as she also feels unfamiliar sensations. It's creating a shared feedback loop between them, Darsce's pain received and confusion given in return. Thus, Darsce's answer to Jethaniel is less coherent than her normal might be. She shifts onto her back eyes, meeting Jethaniel's as she levers herself onto her elbows in preparation to… she doesn't know what. She ought to be doing something. There is a bag of her overnight things packed including a baby blanket and a set of tiny clothes, a simple, soft one piece outfit but that's been all but forgotten. Need? "I…don't know," she says after a lengthy pause, then mutters, "They said I should… go to the infirmary." Aaand she'd get right on that only another contraction, visible under the thin shift she's wearing, interrupts the would-be thought. When it passes, she flutters a hand dismissing the idea of a hike across the meadow, "Can we just bring the infirmary to us?" A visit to the infirmary certainly seems sensical, and Jethaniel nods. He reaches his hands to assist Darsce's rising… only to see it delayed by the progress of a contraction due to certain biological processes which are not particularly amenable to delays. They remain there, and his eyes remain on her. Given the circumstances, he is most assuredly awake despite the hour. Jethaniel is not so anxious as Darsce's firelizard, given that he lacks the direct experiential factors but possesses a rudimentary awareness of what is occuring, but he is certainly concerned. "Ah." His lips tug wryly, and he shakes his head to of her proposed revision to their course of action. "Not… effectively." He reaches for her hand, curling fingers to hers. "We may go slowly?" he suggests as - if not precisely an alternative - a variant on the procedure. Similarly, "Or obtain a transport dragon." They are not usually engaged for distances this short, but then, neither is their cargo usually in the process of parturition. Darsce has flopped back to the bed, eyes shut with a sort of patient endur- nah, that's so far from the truth it's not funny. It's more like if she shuts out the present circumstances, they aren't happening to her sort of thing. The word 'effectively' elicits her to crack an eyelid and grimace. "We can pay them extra?" She's barely begun and she's tired already. The touch of fingers to hers opens her eyes once more, this time to stare at him in bewilderment. "Slow…ly?" She cannot imagine doing it at all, let alone slowly. Nor can she conceive of climbing up a dragon and then back off of it. Nevertheless her fingers respond by curling 'round his. "Yeah, well, they said to come when I was ready. And-" Another spasm stops her, a soft groan echoed by a sharp chirp on the headboard and more breaths before she finishes, "I'm not. Can't we just do this tomorrow instead?" Or some other day? When she's brave (or insane) enough to face it? If Darsce cannot see it, the process of labor will… entirely fail to be dissuaded. There are, in fact, many things which will not dissuade this process; it is a rather persistent one. Jethaniel frowns slightly, not for Darsce's petulance (which is comprehensible, if ineffectual) but for her suggestion of bribing (or at least providing hazard pay to) the healers. "I… can attempt to obtain them," he admits. Their house is not particularly suited to becoming an impromptu infirmary; that bed is both more comfortable than a cot and less easily cleaned. Nevertheless… he accedes to the suggestion, though he does not actually release her fingers in order to go do so. "I suspect they were… being figurative," he notes, ducking his head and lowering his gaze to observe her stomach and the current condition of her figure. "It does appear to be time." The time, wherein Darsce will have her child and also receive her body back as if it was some form of prize being held in escrow. "…not tomorrow." Though the healers might, were they here, explain facts about potential durations in far too cheery tones. There may, in fact, be no tone sufficiently grim to properly express those facts. Jethaniel is not considering that, merely regarding Darsce with concern as he attempts (without the specialized knowledge of a healer) to assess the appropriate course of action. "…shall… I go?" As par for the course, there are many things Darsce cannot (will not) see until she has to. Though she was only half-serious with the wish to postpone the inevitable, she does hear the rest of his words and nods to them. She's semi-focused on a few other things though, one of them being his frown. Unsure what's caused that, she mirrors it. Healers… make house calls occasionally? But perhaps it's her attitude… So she mutters under her breath, "I'm sorry. I just… you know. It's the…infirmary. The place…" Well, he knows. She hears the word 'go' and makes a strangled sound, "No! Don't…leave me here alone!" She flail-fumbles to sit up, retains his hand as an assist to do so. Somewhat calmer, also a touch grumbly, "We'll both… go." Getting there still seems impossible to her but she's going to give it a try. "I'll just throw on something…else." Besides that brief shift she's got on, which turns out to be a loose-fitting sun dress-type smock. She stuffs her feet into sandals, runs a brush through her hair and forgoes makeup altogether. Not that she doesn't briefly think about it, in fact her hand hovers over the cosmetic kit until another contraction prompts her to forget that idea and move to the door. "Can you get my bag?" While the tilt of her chin says 'no big deal' the flippant words come out wobbly, "Let's do this!" Healers do make house calls. Under the circumstances… perhaps they would, were a message to get to them. Jethaniel might be better suited to handle the logistics of that were he thinking more clearly, but he is perhaps not entirely focused himself; his concern for Darsce makes it… rather difficult to think beyond her, even when the intended thoughts are for her benefit. She would prefer to not go to the infirmary; he understands this, and murmurs a soft, "I'm sorry," with a downward flick of his gaze… which only serves to remind him of the situation (not that he'd forgotten) as his eyes settle once again on the curve of her stomach. He could go… but she does not wish him to, and Jethaniel nods to that with… a certain relief. He did not actually wish to leave Darsce; his fingers curl more firmly around hers, the other hand reaching around her back to help support her as she sits up, rests there a moment in a half-embrace. "Together," he agrees earnestly, and nods again as he helps her to rise and prepare. He accomplishes his own clothing quickly; a shirt pulled down over his head and a pair of trousers up and into place. A pair of shoes (he forgoes socks for purposes of expeditiousness), and he is ready. Despite having more articles of clothing than Darsce, he is ready before her… but then, she has ample reason to be slow. Having prepared himself, Jethaniel hovers near, following Darsce before nodding at her request. He takes the bag, puts it over one shoulder… then hastens his steps to catch up with Darsce once more, arm reaching to hover around her back even if the passage through the doorway will require them to proceed in series rather than parallel. While those contractions aren't really all that strong presently, Darsce tends to have a low pain tolerance and less patience for discomfort than oh, say one of her sisters might. She leans into Jethaniel during that half-embrace, arms curling around him a bit spasmodically, communicating both her trepidation and her love before releasing him reluctantly to get ready for departure. Down the stairs is easier than up and across the meadow, while more distance than she prefers to walk tonight, isn't truly all that bad between those stops that have her trying not to double over while gripping Jethaniel's arm. Coherent thought will likely escape them both tonight. One thing that Darsce doesn't escape is the tiny gold - who flutter-hops along behind them chirp-chittering quiet anxiety, hiss flapping her wings with each contraction and tangling about one of her person's ankles in a lizardly embrace borne of fear and affection. She might even ride along that way, for Darsce just doesn't have the wherewithal to bend down and peel her off. It's somewhere near the edge of the clearing that water breaks - thankfully the unnamed firelizard is several hops behind her when that happens - apparently the walking has been beneficial at least as far as the progression of labor. Darsce? Is mortified. Have they told her this was expected? Probably in that damned pamphlet but she's forgotten half of it by now. At least the string of swearwords are mumbled enough to be unintelligible? Jethaniel's arm remains around Darsce as much as possible. He does not - quite - attempt to carry her. There are moments when it seems he might be tempted, but he does not… merely provides support both physical and psychological, an arm to grip and gentle touches of his fingers along her back. The firelizard is… noted, but any attempt to remove her would (while likely in line with Darsce's inclinations) require him to remove his own arms from Darsce, and so he does not. Tonight is… while broadly something whose outcome is desirable to her, not precisely enjoyable in its details and something she might well prefer to have be tomorrow… or next week… or a month ago and over now. Unfortunately, there does not exist a mechanism to skip to more desirable moments, and so Darsce has no option but to encounter one of the less positive aspects of this process. As she expresses her disapproval, Jethaniel steps closer to her, putting both of his arms around her instead of merely one. He holds her, quiet for a moment before saying softly, "We are nearly there." At least it's still night and there won't be many people around to see? The infirmary here is intended for human care. It is spotless and smells of disinfectant, cots are lined up against one wall, a curtain can be pulled to give some privacy to the occupants of the cots if they so desire. A cabinet stands off against another wall, instruments and medications stored against when they will be needed. 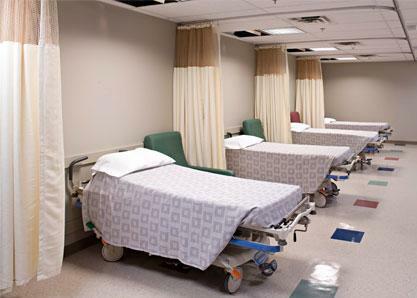 A couple of curtained off beds are used for examinations of patients and the treatment of minor injuries which won't require long term care. A desk with chair is just off of the doorway for the healer to sit and catch up on record keeping after a long days work. Where IS a Tardis when you need one, huh? Though Darsce has ridden a wild blue dragon, a blue box… no so much. She is quiet after that little outburst, forehead on Jethaniel's shoulder for a sniffle or two in his arms before she nods and lifts her head to attempt a half-smile at him. "Almost," she agrees as softly. Indeed, is there's anything to be happy about besides the baby, it's the baby's timing. And so they arrive in the infirmary, her sandals making squeak-squish noises on the floor, the hem of her dress is only a bit splashed, since it's just below her knees and though her face is sans makeup, her hair damp with dew or perspiration or both, there's no one but a couple of on-duty healers to witness her being less presentable than she'd like. They're directed to one of those back cots with the curtained alcoves where she's handed one of those lovely gowns with the flappy, open backs that sets her to sputtering, "Fine, fine. I'll wear the damn thing. BUT! I…am…SO! Going! To! Design…!!!" The rest is followed by incoherent muttering but when the infirmary gets a stack of eye-catching, colorful and fancily-trimmed flappy backed gowns they'll know who to thank (blame?). She'll do it with her own funds if necessary, but they're getting them regardless. She spends enough time wearing the damn things. Perhaps the chameleon circuitry is functioning properly to keep that Tardis elusive, or perhaps… ah, regardless, it is absent and cannot be used in this case. Jethaniel nods to Darsce, and while his expression might only barely qualify as a smile, it is certainly inclined toward both tender warmth and concern. As for their arrival in the infirmary… if the healers' gowns are to be taken as a representation of their comprehension of fashion, Darsce need not be concerned regarding their judgment of her present state; she has already surpassed their standards, which is why they require her to put on a garment which will (if lowering her presentability yet further) at least raise accessibility. Jethaniel sets the bag down on a small table, then returns to brush his fingers to Darsce's lower back, whether or not there's a flappy gown involved yet. It is, at least, unlikely to draw attention… and really, does she want people looking at her right now? So. Present time it is then! As for fashion, what Darsce wants is to look not washed out and pasty-completed if people do happen to look her way. Primarily that'd be Jethaniel. While the healers breeze cheerfully around in their healer purple, why do they insist the rest of them languish in these faded…colorless things? Bah! Even when, in some cases (hers, presently), there are certain states wherein no amount of eye-catching hues will fix, feeling pretty is the idea. It's alllllllllll about a healing mood (even though if asked Darsce couldn't come close to articulating that part. Perhaps Cyrus could have? Naaah, probably not). It takes Darsce some effort to remove her smock to don that gown and then she'll need help tying the back. When she's set, one of the healers checks her and happily announces that it'll be hours yet, then leaves them to wait it out with an 'I'll check in with you now and then'. Darsce's trying to be less… fussy, failing miserably, though the request for help with the ties had been phrased reasonably. It helps that she hasn't had another contraction since her water broke, but oh when the next one hits, she isn't ready for the difference! There is no soft groan this time, but a shout, "OHHH MY Fuh-REAAAKING-!" The rest of the words following that aren't pretty. The cushion is gone and their baby is no longer basking in a waterbed, consequently muscles grip harder and bones feel a cetrtain pressure they've never felt before. Thankfully(?) she has to breathe hard and further words aren't possible until it passes and then it's a tearful wail, "Who-what-?! The pamphlet said 'uncomfortable'. This is not uncomfortable - this HURTS! They liiiiiiiiiiiiied!" She turns a beseeching look at her husband, "Whyyyyyy do people dooooooo this to themselves??" She ignores the healer who pokes her head in to see if everything's alright (she blames them for the misinformation - even if by the time she recieved it, nothing would have changed). And… she isn't even to the hard part yet. The time is now. The place… is the infirmary. The attire is… problematic, but Jethaniel is nevertheless looking Darsce's way in a more than coincidental fashion. He is obliging in his assistance to her change of attire, concluding the gown's tying with a soft kiss to her shoulder, then draws the chair conveniently provided for this purpose close to the cot so that he may sit there, reaching for her hand and curling his fingers around it gently. Is this the same alcove as after the racing incident? It's unlikely he would recognize it even if it were, given that his attention at that time was also mostly on Darsce rather than their surroundings. It would seem the infirmary is significantly lacking in efficiency, because once again the primary procedure is to wait. This time, however… there are other events occuring. Jethaniel may be waiting; Darsce, as construed by her intentionality, may be waiting. Darsce's body is not, and neither is their child. Jethaniel's eyes widen at Darsce's verbal statement expressing - if not that, precisely, a related concept - and he winces as his fingers caress against the backs of hers. This particular statement is of a type concerning which healers are often prone to falsehood; there exists in the craft a tendency to understate pain, even that what is capable of producing strings of expletives containing a great many other four letter words. "I…" he begins, and the words trail off unsaid as he looks back to Darsce, a guilty expression in the slight forward tip of his head and the way his mouth wants to draw in. There exist a variety of answers he could give; statements concerning the desire for progeny or the consequence of impulsive actions. Many of these answers would, in fact, even be true. "It… will pass?" And then there'll be the hard part! Stay in the present, Darsce. You can do nothing to change the past, and the future will never come exactly as you plan or hope for? And yet… she eyes her husband with some skepticism. Sure, it'll pass - over and over and over again after each wrenching squeeze. She's already blotted the hard part out of her mind with the kindling of that blasted pamphlet in the hearth. When her body relents, she uncurls, twists on the cot to lie on her side facing Jethaniel. The discomfort has indeed eased, passed enough to allow her to breathe. She does so, cautiously relaxing. She caught that guilty look and with a remorseful tug at his hand seeks to draw him closer, presses her cheek to his hand. "It's not your fault. That was a self-directed plaint. I want your baby." Just… not the pain. Though - hah - if she thinks it hurts now just wait until it's a teenager! But that's…tomorrow not today. Today there is… yet another contraction that grips her and though this time there is no shout because she holds it in, a hiss of pain escapes her mouth and the tiny gold, clinging to the curtain above, echoes it. When it eases there's a sparkle of frustrated moisture in the iceblue eyes that seek Jethaniel's. "Do you think she's about ready to come out yet?" Because Darsce is certainly more than ready! Aaand they've been in here barely twenty minutes. The pain will pass; so will the moments between it, creating an alternating series that will eventually - or, depending on one's scale of reference, soon - pass. In the meantime… Jethaniel is easily drawn closer, but as Darsce leans to his hand, the brush of his thumb along her cheekbone is soft enough to be almost hesitant, and his nod is a slow one. Whether or not Darsce blames him, there is certainly some degree of culpability to be assigned to Jethaniel… but at least, attribution (and opinion of the intervening steps aside), this is something that Darsce wants. Still… "I wish I could help," Jethaniel says quietly, his fingers curved against her cheek. They remain there as another contraction passes through her, and while Jethaniel winces again, he doesn't look away, eyes remaining on Darsce's face as he watches the pain which - despite her lack of outburst - is quite clear. "It… may be a while." He pushes his chair closer to the cot - then sits on the edge of it to place himself closer still, tracing up along Darsce's arm with the hand not resting on her cheek. The moments pass; hours pass. Time doesn't stand still, even though to Darsce, who's spending it in a haze of pain bouts alternating with either rest or restlessness, it seems to. Sometimes she's siting up on that cot, leaning against Jethaniel, other times she's lying down; the healers have even gotten her up to walk now and then, much to her astounded chagrin. At some point in there, she's assured Jethaniel he is helping just by being there, but she'll also half-laugh, half groan and present her back and shoulders for him to knead tight muscles. The sun rises, the morning advances, lunch comes and goes, dinner as well. Though trays have been brought for both of them, Darsce has no appetite and eats nothing from them. Fluids are encouraged, but even those take some effort to actually sip. As the hours pass to late evening and the infirmary quiets for the night shift, she's progressed from 'discomfort' and fatigue to definite pain and exhaustion, sleeping those eight or so minutes between the clenching of muscles. Those periods of rest she's been getting grow shorter and shorter, the healers' presence more frequent until the point where they announce it will be very soon and things bustle as they postion the mother-to-be for the arrival of the child, place folded towels on that cot, arrange certain instruments and instruct Darsce to 'just breathe like a puppy panting, don't push until we say.' Darsce… hears and acquiesces without argument, though she appears somewhere…else. It's a world of her own really, though at one point she tosses damp hair out of her eyes to seek Jethaniel's and with her voice a peculiar breathless half-laugh, half-whine, "Can I hire someone else to have this baby for me? Please?" Her weak attempt to keep from shouting obscenities, is followed by a twisted expression of pain. At the foot of the cot, the healers concur, "Baby's crowning! Hey dad, would you like to receive your child as it enters the world? We'll guide your hands." Jethaniel is somewhat more conscious of the passage of time, though he is not putting the majority of his focus on it. He has, however - given the circumstances - more of that attention than Darsce does, and as such the fractional component which notes time is not so small as to be rounded down into nonexistence. He accepts Darsce's word that he assists her by his presence, but nevertheless seeks to - where he can - apply further aid. This includes the application of his hands, whether to rub as she requests or merely to provide wordless affection with caresses and gentle pressing. When the trays come, he does eat, but not in any particular quantity; a few bites of things, a drink of the lukewarm klah provided with the meal. Despite this caffeination, he also dozes in brief moments, his fingers resting against Darsce's where her stirring will rouse him to provide what measure of comfort he may with his presence… even if it is smaller than he might prefer. "…were I aware of a means," he assures Darsce, but leaves it there, the lack thereof unspoken as he brushes that hair back, stroking his fingers along it gently as the healers make their preparations. Jethaniel's eyes flit to them occasionally, but remain substantively on Darsce even if she is… somewhat distanced at the moment. That is - given her exertions thus far and the sensations thereof - perhaps a good thing. Regardless, Jethaniel remains here by her side. The medical opinion of the healers is - while doubtless interesting - sufficiently disjoint from Jethaniel's expertise to not immediately register, and given the circumstances, he is more concerned with the support of Darsce than the investigation of new terminology. The support of Darsce and… their progeny, who has evidently progressed from 'someday' to 'soon' to… 'now'? His brows arch, looking down to the healers as they suggest a possiblity for his further involvement at this interval. "Ah." His eyes flit back to Darsce, concern in them as his fingers curl more firmly around hers for a moment, then slowly release. If hers do the same, he'll go around to where the healers await and apply his hands (under their guidance) to a task in which he entirely lacks familiarity, let alone expertise. Or - more precisely - the forces being applied to transform an internal to an external. Jethaniel remains close to Darsce, his hands providing comfort whose precise form will likely not be remembered later - and may not even be fully noted now, though Darsce clings to him. The previously internal entity presents itself first as a head - the top of one, exiting along a downward course. Had Darsce's fingers resisted his departure, Jethaniel would have remained by her side… but they do not, and so he goes around to observe the head of their infant and place his hands… where the healer indicates, which means that he goes from holding Darsce's hand to holding her - their - child, the soft skin and gauzy hair on a body which is, relative to the scale of an adult human, quite small… and relative to the path which it has taken, rather large. Jethaniel's gaze remains on the process - more precisely, on the result thereof - with a soft smile and a sense of wonder in those grey eyes as they observe his new… son. He glances up, over Darsce's body to see her… and the fact that she is also attempting to observe, which has his eyes returning to their child. "He is…" Jethaniel's technical studies and vocabulary have not prepared him for this moment. "…ours," he concludes. The healer's opinion of the attractiveness thereof must necessarily be modulated according to post-partum levels of pinkness and residual substances, but Jethaniel's expression nevertheless conveys a general form of agreement, or at least similarly positive associations to those of that descriptor. Though the application of the internal ones have heretofore gripped Darsce, it's the external one that grips her now. She's levered up on one elbow a little bit, eyes fixed upon the curled form on those towels whose head her husband now cradles. The skin is cheesy, the head is somewhat egg-shaped and the tiny face squished, eyes sqeezed shut, but she agrees with both Jethaniel and the healers, breathing in awe, "Our…beautiful…" The healers aren't wasting any time cleaning the infant - that'll come later. One presses Jethaniel's fingers to curl about the child's form in the appropriate places and motions with her chin for him to place it upon Darsce's stomach and so introduce mother and child while the other applies clamps and severs the umbilical cord. Somewhere in the process, a vigorous squalling rises in protest of being jostled but once in his Jethaniel's hands, it quiets as the infant opens his eyes and peers fuzzily up at his father in dewy-eyed fascination. And Darsce beholds them, the - two - men in her life, bereft of words both flippant and genuine while both wonder and yearning mingle with the shine of emotion in her iceblue eyes that is summed up in three little (but encompassing) words, finally breathed into the moment, "I love you." Those two concepts expressed by Darsce's echoed words are, in fact, some of the most important ones in this situation. Jethaniel's fingers make minute motions in the exploration of his son as the healers provide the technical expertise - which is, after all, their function in this situation. As for his own… The child's cry is answered by a wordless murmur from his father, a low sound not entirely dissimilar to the sort of hum an engine would make. His eyes meet those of his son as they open - a first view which will assuredly be remembered by at least one of them - and Jethaniel's hands alter to those recommended by the healer in order to lift his son and bring him to Darsce. Their baby may now encounter the exterior of his mother's stomach rather than the interior, his father's arm remaining around the infant to support him… and encircle Darsce. "I…" Jethaniel's smile widens, and speaks presumptively. "We love you too." Darsce leans back into the circle of her husband's arm as she gazes at their child. She must examine every inch and so her fingers touch the fuzz-hair, trace the tip of button nose and… are those eyes grey or blue? She cannot tell, for when he's placed upon her, they drift closed. She, who never had a puppy or a kitten - nor even a pet until that gold firelizard, who by the way is humming her lungs out in joyous rapture up there on the curtain - leans to press her lips to the forehead, tears spilling soundlessly to trace her cheek. Heedless of the goop yet on his skin (so unlike her! ), her fingers explore the tiny tot with a murmur of amazement, "…exquisite hands…" and the feet, each toe counted with a fingertip while her lips part in absolute wonder at the bits of nails at the tips. "…I will paint them pink for her…" and then back up… Cue the sound of record-scratching here: "Uh. This is not a girl." Yes, yes, they did say 'son' and ohhh now it sinks in. Her head finds Jethaniel's shoulder and she tilts it back to see his face. If she's disappointed it doesn't show, for her hand curls around the baby possessively even as she tells her husband with semi-shocked, dazed finality, "Aerdis… isn't going to work." Because it's girlish and this child is… not. Furthermore, and now somewhat lost, "I… didn't think of a boy's name." Of course she didn't because she was sure it was going to be a girl! "What…how…I… Can you..?" But baby! She has one and while she leaves her head nestled in the curve of his neck and shoulder, she returns her attention to their son. "He's…" Her mouth forms a tender and dreamy smile. For words, no they won't do him justice nor convey what's in her heart. She's delighted, she's enchanted, she's… crying. Blame it on the hormones or the fact that she's exhausted - blame it on Jethaniel, for he's made her the happiest woman on the planet. Now, their child born, Jethaniel once more stays by Darsce's side, his arms around her and that child. He watches, smiling, as she explores the shape of this tiny human; the forms which are substantively similar to all members of the species, even more so to those of the same age category… and yet this baby is theirs. This one, worn from the ordeal of birth and taking comfort in familiar voices now heard without the muffling effect of womb. This one, and though it is as yet unclear whether his eyes bear a stronger resemblance to that of his mother or his father, they will have opportunities to determine. He is, after all, their son. …which means there's a slight parting of Jethaniel's lips during Darsce's commentary regarding his nails, followed by… "No. He is not." Hence the prior use of the masculine pronoun in reference to him, as well as the healer's outright statement thereof… though, given the circumstances, it is not entirely unreasonable that it took time for that thought to reach Darsce's awareness. She has reason to be somewhat… elsewhere, even if the baby boy is quite effective at drawing her attention to him. Jethaniel's gaze drifts from his son to his wife, his grey eyes meeting her blue ones. He inclines his head to acknowledge the necessity of alteration to the previously proposed name, then tilts it to brush his lips to Darsce's hair. "Perhaps…" he states, which may exist as his acknowledgment that he will apply himself to the task or the beginning of a statement which takes some time to complete, as he must consider on his reply before making it - though he does so with Darsce leaned against him, their baby held to her, and if he is slow to reply that is perhaps understandable; he has, while not undergoing any experiences as exhausting as that of Darsce, been here with her. He has been concerned for her, for what might be attributed to him… but though she weeps, the rest of her signals make it clear enough that she is anything at all but displeased, and so he simply holds her close, gaze on her and their child as he thinks and - eventually - concludes the sentence he began. "…Dariel." Perhaps Dariel, if the two parts are to be put together; and the name is, in fact, created from two parts. The first is from Darsce; her husband has previously stated a fondness for her name. The latter half may be constructed as an inverted but symmetrical slice from his own name… or perhaps as a continuation of the name-ending of both Jethaniel and his own father; the familiarity serves to make it easier (or perhaps possible) for his worn brain to construct and propose this name. During the time the new parents bond with their son, the healers are busy with doing healer-y things to Darsce and tidying the cot, changing linens, their movements deft and unobtrusive. They'll shift her a bit to one side, then the other but do so minus their cheery commentary, something Darsce hardly notices but were she to, she would appreciate it. She's lost in the wonder of this…new… wow. She's a mother! Can't say she never saw it coming, but… she's entranced. She considers the name, gaze upon her sleeping son, tries it out with a whisper, "Dariel." Her smile is flickery with several emotions and she swallows several times before she tips her head, still on Jethaniel's shoulder to seek the grey eyes she loves so well. "I like it. And I think it fits him." There's a soft wonder in her iceblue eyes, a luminosity to her face that… well. Something major has shifted in her that can only be attributed to little Dariel. There's also pride in her expression, perhaps for the both of them having produced the babe and she murmurs, "This is something no one can tell me I did wrong." It's while she's leaving a kiss on his jaw that one of the healers comes for Dariel. "We'll get him cleaned up, weighed and bring him riiiiight back!" The promise is made, but the strangled squeak of protest issues from Darsce's lips anyway and her hand is reluctant to slip away. Her eyes follow the infant hungrily as the healer steps away with him and then she fidgets restlessly. There exists a certain distinction between projections of the future and their actual observance. Sometimes, events do not occur as planned, or the details which are discovered (or the context in which they happen) are… important. Darsce is, in fact, a mother. Jethaniel's fingers brush against her shoulder as she considers the new proposal for a name, necessitated by one such change to the course of actual events. Given the circumstances… she finds it acceptable, and Jethaniel's eyes meet with hers, warm and soft as he nods to her assent. "Dariel, then." Their son, and Jethaniel's gaze studies Darsce's expression before he nods again "He is here; it is right." Though Darsce will find out soon enough that when it comes to mothering, there are a great many people who will be very happy to tell her she's doing all sorts of things wrong… regardless of what it is that she's doing. Jethaniel's head turns from the observation of Darsce - and, peripherally, Dariel; they are composed so as to create a single unit - at the healers' removal of him. Jethaniel's arm curves more firmly against Darsce, the intention one of comfort rather than actually seeking to restrain her from leaping forth to wrestle her child back from the healers, and he observes the process whereby their son is assessed on factual metrics. The arm about her is indeed comforting and Darsce leans into it. Oh, she will assuredly find that mothers, moreso than fathers, get blamed and criticised for their techniques of raising their children. Likely the discovery of such will be unpleasant for Darsce - as well as for the hapless meddling person who dares voice such to her face. Ahh, but that's an explosion awaiting another day. Her mind is nowhere near that, only that her body has helped produce Dariel and he has arrived in this world whole and undamaged. He's more than here. "He's perfect," she asserts peering quizically up at her husband, for that seemed quite neutral to her. This time she doesn't murmur it. Hear that, healers? World? He baby is perfect! The healer returns with Dariel, wrapped in one of the soft blankets that the parents have brought and this time they offer the babe to Jethaniel. Darsce eases from his arm and reclines back upon the pillow so he may take the child and now it's her time to observe him, almost nervously. Is she afraid he'll break Dariel? "I hope…" The yearning on her face is unmistakable, though she cannot bring herself to voice her thoughts regarding her little family and his feelings on the addition to it. Instead, now that she's no longer lost to the birthing process, she watches him. "I am glad," Jethaniel answers Darsce's statement of their son's perfection, and leans closer to brush his lips to her forehead, now no longer strained. "He is…" and here Jethaniel pauses, for the healer has returned and Dariel is - whatever else he may be - with his family once more. Jethaniel's brows rise slightly at the healer's presentation to him, but there is no particular hesitation to the withdrawal of his arm from around Darsce. He takes Dariel gently, which may assuage any fears of breakage, and holds him with one arm beneath and the other around. Jethaniel's gaze is on his son, not his wife, and while his expression holds a certain similarity to that he might demonstrate while considering a technical problem or a set of schematics, it is not entirely the same. There is interest; perhaps even fascination, such as Dariel (despite having an as-yet incomplete model of social interaction) also possesses for faces. The connection between parent and child is, while asymmetric, bidirectional. Jethaniel watches his son, tracing a fingertip down along his arm, but he is not entirely oblivious to Darsce. "What is it?" he asks her quietly, as he gives his son the same sort of attention he might give the starry sky. He handles their son with an expertise that Darsce will take some time learning and yet, the apprehension, faint as it is, remains. Following the question, she's silent for several moments, simply considering the pair. While there's a fond twitch of lips for that scrutiny he gives his son, there's an uncertain line to her mouth. Finally, she remarks, "I… you've barely said two words since he was born. There's only one other time I remember you being at a loss for words." And that was not a happy time for him. "Are you…" Several words could apply to the end of the question. Disappointed, for example. Instead she half-frowns, "…alright?" And then in a rush of emotion she asks, "Are you pleased?" The glitter in her eyes is blinked away almost angrily. "We can try again for girl if you are. Or we don't… have to have anymore if…" She's tired, she's emotional and, unfortunately perhaps, she's… D'had's daughter. Jethaniel blinks at Darsce's assertion concerning his words, or the relative lack thereof. "I… have?" he asks, thus doubling the quantity of words he has putatively spoken. His eyes lift to Darsce, studying her with a certain measure of perplexity to, in not displace the wonder previously there, at least coexist with it. He is… confused, yes; tired would also be an accurate representation of certain of his feelings, though Darsce has more reason than he to be fatigued. Alright? He is that; he inclines his head in a slow nod, his arms remaining around their son but his eyes on Darsce. They widen as she continues, incomprehension and concern. "Darsce, I…" Jethaniel shifts, an intention to move toward Darsce that is forestalled by the child in his arms, limiting his movements. Instead he swallows, fixing eyes on hers. "I am pleased." The words are clearly spoken, his gaze steady. "I had… thought myself prepared." He had concluded such, given the available evidence of his desires. "I was wrong; it is…" His eyes lower, regarding Dariel as he says, "…a remarkably vast thing despite being so tiny." Jethaniel lifts his gaze once more, seeking Darsce's. "He is my son. That is what I want. My child, and… I have him." "At a time," Darsce clarifies, nodding with troubled eyes meeting his. "Two here, two there. Clinical ones…" Her mouth tugs to one side quizzically. It's unusual enough for her to have noticed and mentioned it. Though now that she has… his confusion is evident and the her baffled expression increases. He shifts; her hand, the one nearest him, twitches and lifts an inch before falling back to the cot, the reach for him aborted when he trails off. His first words finds her exhaling a breath she'd unintentionally held, her clouded expression begins to ease, but the next several words produces tension anew. Ah here it comes! He wasn't ready after all. This is what her mother warned her about regarding men. She braces to hear the expected withdrawal, the coming goodbye… that is until he expands. The words ease the tight line of her shoulders, dismay fading slowly in the iceblue eyes that are there when his lift back to hers. Such a roller coaster of emotion in her! And each up-down thought has chased each other across her mobile face. "Oh," she breathes at last. A small, uncertain smile quirks the corners of her lips, "You said so little, you looked so serious that… I couldn't read you. I thought you were… discomfited." Perhaps the lowering of Jethaniel's eyes is in part to avoid the bafflement in Darsce's; to gather his thoughts, his own uncertainties and the emotions that shape his response without the added layer of her reactions. If so, it is natural that Dariel provides that focus; he is the impetus for those emotions as well as a source of complexity which Jethaniel now seeks to understand. Differently complex is the interaction of emotions between his parents, and Jethaniel's eyes are on Darsce's as he listens to her reply. The corner of his mouth pulls in, his chin tucks in what's almost a wince. "Ah. I am…" Sorry? Likely, but he leaves it unsaid. "I am happy. I am… also perhaps terrified, but I want this." There's a wry sort of smile, but after a moment, concern resumes ascendance in Jethaniel's expression. "I know you wanted a girl." Or at least, that she had presumed that would be the outcome - not that biology is much inclined to take its cues from such desires. Darsce can guess the unspoken word. "Please…don't be. It's okay. I was just confused." This time she does reach for him, brushing the back of his hand with a light-fingered touch. "I didn't expect you to gush." That wouldn't be the Jethaniel she knows. Serious in the wake after he describes his feelings, fears and desires, she nods slowly, her smile still flickery but her own fears have ebbed to the point where her weariness is forefront. What's for her to be trepidatious about now? She's been through the worst - ha! Little does she know! To the unexpected outcome of the child's gender, she shakes her head quickly. "I guess that was because Asher had all girls. I assumed I'd be like her." What a thought, huh? She smirks, "At least in that regard." Her gaze returns to Dariel and the curve of her lip sweetens, "He's perfect; I'm not disappointed. We will, however, need to find him something to wear other than the dresses I've amassed." And that is the appropriate word. There are many of them! Back to Jethaniel, the smile for him is a drowsy one, but there's an appeal in it as well. "Can we take him home tonight? And sleep in our own bed?" Because they've been up for nearly twenty-four hours now. Jethaniel nods to Darsce, with a soft smile for some combination of her words and the touch of her fingers to his. His lack of physical reciprocation is due to the child in his arms, but the smile may suffice to replace it… at least for now. His concern is still present, but what he sees in Darsce - now - is pleasure mingled with fatigue to the point of exhaustion. This, while still concerning to him, is a problem whose solution is known. The actual implementation of that solution, given Dariel's presence and his requirements, may be more challenging, but in principle, Jethaniel is aware of and endorses a course of action which leads to Darsce's recovery from this fatigue. Darsce's explanation regarding the source of her expectations receives an arch of Jethaniel's brows, an, "Ah," followed by a nod as she explains the limit of her assumption. "You are not," he states, and it is left ambiguous the extent of his statement regarding the lack of similarity. Certainly, Dariel's presence provides at least one obvious proof of difference. Jethaniel nods to the necessity of alternate clothing. "We do have some things in neutral shades." As opposed to the vast hoard of pretty dresses suitable for the hypothetical girl who has not, in fact, been born. Those onesies and snap-together pajamas may not be aesthetically advanced garments, but they will suffice to cover Dariel until such a time as his wardrobe can be expanded. As for their departure tonight… "I hope so," Jethaniel says, and turns to look at the healers. They may - on certain previous occasions - have conducted their exit from the infirmary on their own recognizance, but given that Dariel is not entirely capable of providing an accurate assessment of his needs (and his parents have an imperfect understanding thereof), Jethaniel is inclined to obtain at least minimal guidance from the available experts on postnatal care. Aside from the fact that Darsce has, on the way here, done more than enough gushing for the both of them, she meant it in the metaphorical sense. She has seen him wax eloquent over geology and astronomy and well, the brief wordage has been…unexpected. As for her pleasure, it was there before when she was dreamy-smiling over their son. It had been eclipsed by other thoughts only when she emerged to worry about things she shouldn't have. Reassured about that, she throws him a knowing look followed by a smirk about Asher and refrains from commenting further on her mother. Instead, she nods uncertainly about that neutral-colored clothing. It'll be something the fashion-conscious headwoman will be looking into sooner rather than later - even though practically-speaking pants and shirts aren't going to be required - or wise - for awhile. Oh, she'll learn! Most likely by trial and error (error mostly). She too, peers for the healers, who are over by the desk entering notes on Darsce's chart. Perhaps feeling the pair looking at them, one lifts her head, rises and glides over to the cot and chirps, "Ready to get settled for the night?" That indignant snort? Yep, that'd be Darsce. "I'm ready to go home!" And with that she kicks the covers aside, sits up in that cot, swings her legs over the side and requests of the healer crisply, "Bring me my clothes please!" The stars in the sky and the rocks beneath his feet are both things that Jethaniel has - prior to that appreciative expulsion - studied. The babe in his arms is one for whom he has not yet conducted sufficient study to extol in any particular detail, thus his quiet fascination rather than demonstrative statements. This is, if not the first time Darsce has observed him acquainting himself with a new subject, one of both the most significant and most wondrous. Their son's clothing, on the other hand, is not something whose details Jethaniel considers particularly significant; there exists a default implementation which Darsce may adjust as she sees fit in order to iteratively arrive on something which satisfies - to varied extent - both fashion and the exigencies of caring for an infant. The healer's statement to Darsce makes her husband's gaze return to her, and her reply thereto… does not receive a comment from him. He does not seek to obtain her clothing, but neither does he provide a counter-argument. There is a slight smile for seeing her enthusiasm - it provides a welcome counterpoint to her exhaustion - but most of his attention remains on holding Dariel, and he looks down to his son to gently rock him rather than taking either side of what… may become something of a dispute, given Darsce's opinions of the proclivities of healers. Jethaniel keeps Dariel held, and if there is a moment when his frown is concerned for Darsce's decision to depart… he does know that their cottage is suitably stocked for their new child, and while he has never provided care for an infant this young - or one that is his own progeny - he does possess a basic understanding which… will prove quite useful when Dariel does begin to cry, given that the pamphlet - if it's even read - is lacking in both diagrams and kinesthetic experience. They will, however, survive the night, and the next day Jethaniel will assuredly not be going to the office, whether or not his time away is officially constituted as maternity leave or filed under a different time code. The details of that implementation will be left until later; more important to him are the details of caring for both son and wife as the three of them investigate the new configuration (and, for one of them, the newness) of their lives.